Everybody wants to succeed. Succeed individually, or succeed together in a community or group they have. Even so, we can find that perceptions of each person or group about the meaning of success are often different. There are those who interpret success as the achievement of a target that has been targeted, but there are also those who interpret success as a sense of satisfaction with a process that has been passed without thinking too much about the results achieved. Success certainly cannot be achieved without good planning. Some say that someone who does not plan well, means s/he has planned failure. This is true in general. What about those who succeed despite not having prior planning? For example, lucky people who get a lottery, become famous, and various kinds of success that suddenly come. We may see this happening a lot. However, if we pay close attention, people who, despite their luck and sudden success, will soon experience a "fall" because they cannot manage what they have well. This proves that in all situations, good planning is one of the important aspects needed to do everything. Especially if this is very important. For example, in the case of marriage. Two people who want to get married of course must think of many things that must be prepared. Even the preparation and planning must be made several years before they get married. Starting from costs, families of both parties, as well as the future both of them. When we plan things well, we have fifty percent success in our hands. Apart from having mastered what we will do in planning, the remaining fifty percent will be obtained during the implementation process. How to make good planning? 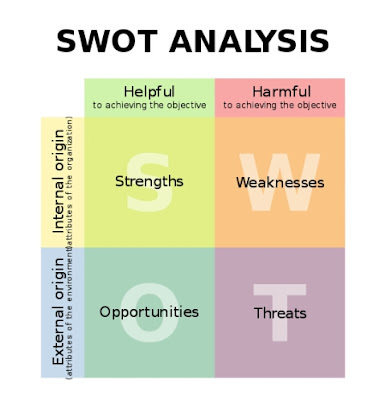 One of the important things that we must pay attention when making a plan is pay attention to aspects of Strength, Weakness, Oppurtunity, and Treath or commonly referred to as "SWOT" analysis. Individually or in groups, this is an important thing that we must consider in a plan. In S-W-O-T analysis, there are two parts that can be divided. There are aspects that come from inside and there are aspects that come from outside. Strength is aspect that originate within us or groups that need to be seen in order to be a tool in achieving success. Our strength in the form of skills, characters and so on are aspects that can be used as our strength. Each person sometimes has different strengths. Therefore, we must also discover the characteristics of our strength. Weakness is aspect that also come from within us or groups that need to be seen so that we can "press" or minimize, minimize carelessness, or hinder ourselves personally or in the implementation of the plan. Opportunity is aspect that come from outside of ourselves or groups that need to be considered so that we have gaps in seizing or achieving success. Especially for this, we need to be smart in seeing, because there are opportunities that often arise and also there are opportunities that only appear occasionally. Treath is aspect that come from outside of ourselves or groups that need to be considered so that we can strategize well, so that the threat does not adversely affect the implementation of the plan, nor bring failure to us.